It’s not just in the US that these problems are occurring. I’m currently off sick with anxiety and depression—this is my third episode and I’m only thirty-one. The first episode started in medical school during a particularly unpleasant ‘teaching session’ where I was ripped apart in front of a patient and my peers. My best friend stood next to me whispering, ‘It’s okay, it’s okay’ in a bid to stop me from breaking down then and there. We moved to the next patient for one of my peers to be cross-examined, when this patient looked at me and offered me a tissue because she could see the tears in my eyes. Today I sat down with Sydney Ashland (a physician mental health expert) to discuss the dangers of fear-based medical education including the much-dreaded tradition of pimping. Sydney Ashland: Well, It’s really a tragic issue and one that over the years I’ve become more and more aware of. Originally, I worked in HR and recruiting in corporate America. When I transitioned into more of the medical focus, I was shocked to experience the trauma, the trauma bonds, the fear and anxiety and hypervigilance that plagues medical students, and the dynamic between the medical schools and their administration and then professors and what happens. I think that we have a lot of victims here. It’s not just the students. Everyone who works to educate these students started with the idea that they wanted to make a difference in the world, I’m sure. They—just like the students they’re mentoring and teaching—were at some point victimized by those in power who created a fairly toxic system because they didn’t know how to get so much information into these minds and help them become excellent technicians without all of the pressure, all of the competition, the very, very high standards. I’m all for high standards. I want to know that when I go to the ER because I was hit by a bus that they’re going to be the best orthopedic surgeons that you could possibly want and that they’re going to know their material, that they’re going to put in the right titanium rods and they’re going to know exactly where to put the pins. Education is really, really important. What has become quite toxic is the fact that these highly motivated, highly intelligent individuals who are attracted to medical school and who have often had a fair amount of adversity and challenges in their life because that’s what helps to create this personality type that is type A, that is achieving and indomitable and challenged to participate in this process. They often think given their background, “I’m totally prepared. I’m ready for this. I can do this.” They are shocked when they get into medical school and find that the pressure is beyond anything they ever imagined. That’s not just because we have high standards when it comes to the material. It’s because we have very, very high-level material that is shared with these individuals in very high-pressure situations where there’s often sleep deprivation, there’s often cramming, late, late nights, incredible competition. Pamela Wible: The use of a lot of medications, right? Sydney Ashland: That’s what they have to do. If I’m not taking Adderall so that I can focus. I’m on an antidepressant because . . .
Pamela Wible: It’s all because everyone else is on Adderall. Sydney Ashland: Exactly, or highly anxious. Anxiety, depression, focus. Those are the three areas that students . . . and they self-medicate. An Adderall alone might not have done it, but maybe an Adderall with Red Bull and then before you know it, you have somebody who is consistently dehydrating themselves. Then, they are pouring coffee on top of it. Instructors are just saying, “Keep up. Keep up. Keep up. Keep up.” Often, maybe even unaware that that’s going on and it becomes this really toxic environment where people aren’t really understanding the dynamics and what’s going on and people get desperate and they get sick and they fail. That’s the other piece of it. There are a lot of people who go to medical school anticipating getting into a residency, but because what they need in order to do that successfully is not there. They end up crashing and burning before residency or not matching or not passing some of the tests. One of the dynamics that I wanted to talk about today is the fact that the medical school has standards. The instructors come with expectations for these students and because they were students once themselves, their expectations can be distorted by their own experience. One of the ways we tend to educate in America is with hierarchy and fear. We are in an environment where we set standards. If you are to achieve and be acceptable, you are going to be at the top. If you are not at the top, then we are going to motivate you by inciting fear. Pamela Wible: This starts really early. I remember in middle school, they told us in sixth grade. I don’t know. Maybe we are rowdy that day. The teacher said if we don’t straighten up and pay attention, we are just not going to make it into seventh grade because seventh grade is really hard. What is this? Sydney Ashland: When you are in middle school, you learn at that level with fewer pressures in your life because you are still a kid. You are still outside playing. You are playing video games. You are reading. You are with your friends. You are able to manage that level of fear. Even in high school, you are still able to manage the fear. Often, you get into college and then the ante gets raised. It’s like, “Now, it’s a little more serious. Now, I really have to work for my grades.” When you go to medical school, because of the level of competition and expectation, the fear mongering (excuse that term but that’s how I see it) really increases. What instructors and administrators often expect to see in students is fear—fear about not measuring up, fear that motivates them to do very well because if this big stick is going to come and hit you, you are very motivated to stay away from that stick. What happens is you create students who have hypervigilance, who are afraid so they are looking at every turn to see whether they are achieving at the level they need to. They are looking to their peers to the left and the right and they are looking up to make sure that that stick isn’t coming down, so hypervigilance. I’m looking up to make sure nobody is going to hit me or withhold a grade or criticize me or shame me. I look to my peers for support and my peers are so busy trying to protect themselves and achieve that they can’t support me. Consequently, I continue to stay in that hyperactive, hypervigilant state. Sydney Ashland: Yes, that I can’t sustain. Yes, then isolation happens, depression happens, anxiety. Hypervigilance morphs into anxiety when it’s in the presence of isolation. Hypervigilance with isolation becomes depression and anxiety. That just complicates the problem because then I’m even less resourced to show up in a way that impresses my teachers and validates for myself that I’m a smart as I thought I was. Then, my self-esteem starts to tank and I start to feel like maybe I wasn’t as smart as I thought I was. I’m not a smart as all these other people who want nothing to do with me because they are busy studying now too. I’m afraid to ask questions because if I ask questions I don’t know. If you don’t know, you are stupid or you are not keeping up or you are not studying hard enough. One of the classic things that I hear all the time is, “I know how to study hard.” I’m not sure studying hard is really the strategy that works for most people. Being able to study in a way that reinforces your curiosity, frees you to ask questions, gives you an opportunity to take that curiosity and those questions and find answers. That’s what really helps to motivate people and keep people excited and engaged with what they are learning. If it’s all about fear and measuring up and do you want to be a doctor and now you also have $500,000 worth of debt looming over you, it’s just too much and it creates a tension that is creating mentally unstable people who end up very desperate, ready to die by suicide, ready to jump out of med school, but don’t know that they have any other options. For those physicians who managed to make it through that murky environment and graduate and become licensed physicians, they are often scarred by that. They have some PTSD. They have trouble sleeping. Their circadian rhythms are all messed up because they are staying up too long and not eating enough and not drinking water. They are taking medication to try and help. I’m really burdened to help, especially medical students, develop a healthy relationship even in a toxic environment because I think that’s possible. The more people that do that, the more the system will need to change. Much to the relief I’m sure of medical school administrators and instructors because they are caught in this as well. Pamela Wible: They don’t always seem to know the best way to teach with modern teaching techniques this generation of medical students, right? Pamela Wible: I hear even during orientation I feel like they are terrorizing them with fear-driven techniques to try to get them I guess in line and to pay attention and to do what they want. The say things during orientation that are not reassuring at all. They are terrifying like, “Two-thirds of you will be on antidepressants before the end of the year,” is something that recently they said at a medical school I was told by a student. Her interpretation of this was they were being kind and encouraging us to ask for help, so two-thirds of us could be on antidepressants. What is that as an opening statement for a group of high functioning sensitive humanitarians? What does that do to them? Sydney Ashland: I think what that does to them is it sets them up to feel disempowered and helpless and hopeless about their future. That boot-camp strategy of, “We’re going to make you suffer and as a result of that suffering, you are somehow going to be better, but you’re going to need this medication in order to survive it.” That’s not a very empowering message. When you have a lot of people that are experiencing that en masse, then you have a whole group or a whole system that aren’t empowered, that are sort of stuck. The other thing that I wanted to mention is the dawn of technology and how that has changed what it means to be a physician. We expect our physicians to use an electronic medical record. Everyone uses electronic medical records now. We expect them to be able to really maneuver in the world of technology and yet when we trained them we are using these old rote methods of memorization. Pamela Wible: Memorization-regurgitation cycles plus Adderall. Sydney Ashland: Exactly. What you are giving is these textbooks that are absolutely impossible to memorize all the minutiae rather than empowering these people to know where to look. If you know where to look, you can solve almost any problem. You yourself can’t possibly memorize all the material out there in order to find some obscure diagnosis or disease process, but if you know where to look, if you know how to ask the questions there again, you may be asking PubMed or Google or some other Medscape, some other medical site. If you know how to do it, then you’re going to come up with the answer. But if you are pressured to have to house that information in your filing system in this brain, this white matter, while you’re not sleeping, not eating, not exercising and pushing too hard, it’s never going to happen. Pamela Wible: Then, what happens as you show up the next morning in third year for your rotation and you get pimped and I think a lot of people out there who are not medical professionals who may be listening to this later don’t understand what pimping is. I’ll just share that pimping is like this interrogation session, a public interrogation session where medical students are asked in the hospital—often in front of patients and nursing staff. They are grilled on medical minutiae of obscure material. They generally pick the person who is weakest in the group of six, seven, eight medical students hovering around the attending physician and basically grill them until they cry and breakdown. My interpretation of this is that they literally are trying to teach the rest of them that you need to continue studying so that you have all these obscure answers. Also, the fear of asking a question and not knowing and being publicly humiliated prevents people from even having normal free-flow conversation around the patient that they are supposedly trying to help. Is that your understanding of it? Sydney Ashland: I think that’s accurate. Then, it creates incongruency because on the one hand, you are supposed to achieve and be at the top of your class. On the other hand, you want to be invisible and invisibility protects you. How can you possibly do both? I think that’s the dilemma. This environment in medical school that created anxiety, depression, and hypervigilance now creates the perfect candidate to be controlled, manipulated and abused at times by someone else whose intentions maybe good initially, but who use a very ineffective way of trying to teach and motivate. That’s the goal—teaching and motivating—not humiliating, not scaring, not overpowering. We end up with a lot of physicians who are victimized in that and afraid to talk about it, even amongst themselves. It’s just get through. Let me get through this 36-hour shift and hopefully be able to drive home and do it again the next day. It’s dangerous. It’s a dangerous way of training. Pamela Wible: Fear-driven medical education and education in general could have long-term health consequences for individuals. Pimping is the ultimate obvious fear-driven educational method, very public and obvious. Do you agree with this that there’s long-term health consequences in people who have experienced even as a bystander, even if you’re not the one being pimped, but you are witnessing a medical student next to you? Sydney Ashland: I think sometimes the scars and long-term effects are worse for those observing than for the one actually receiving it because they’re disempowered in their witnessing. When you are disempowered in your witnessing, it’s even a worse position because you are mute. You are invisible. You are powerless to help someone who you see suffering. Those that do the best are those who are able to manage to retain some sense of boundaries, so that you can be challenged, get the answer wrong, even have somebody who tries to humiliate you. If you have a clear set of your own self and the fact that my knowledge is not me, it is my knowledge. You retain that sense of boundaries, then you are going to be able to self-protect. In being able to do that in front of witnesses—then you empower the group. That is something that you and I are committed to trying to help these medical students do—is to keep their sense of self, not lose themselves in the process, validate the fact that they’re bright and brilliant and shining stars and that they’re going to graduate and do exactly what they’re here. Most people want to become physicians because they want to serve. They want to heal. They want to take that Hippocratic Oath. It’s just absurd that we torture and punish and create such suffering for those who want to do that. What if those that are witnessing don’t remain silent and someone speaks? I have had conversations with those who have been brave enough to do that. Often, unfortunately, more males than females who can’t tolerate seeing that humiliation and step in. That’s a way of empowering the group too and the more that we do these successful interventions and disrupt the patterns that are toxic, the more the systems will change. I don’t think it’s about necessarily signing petitions or going and talking to your dean or to the hospital administrator. It’s about you taking responsibility and modeling through your peers what it means to have a healthy sense of self, good boundaries and confidence. You can transform the whole system. Pamela Wible: Just by taking your personal power back and not allowing yourself to be a victim. 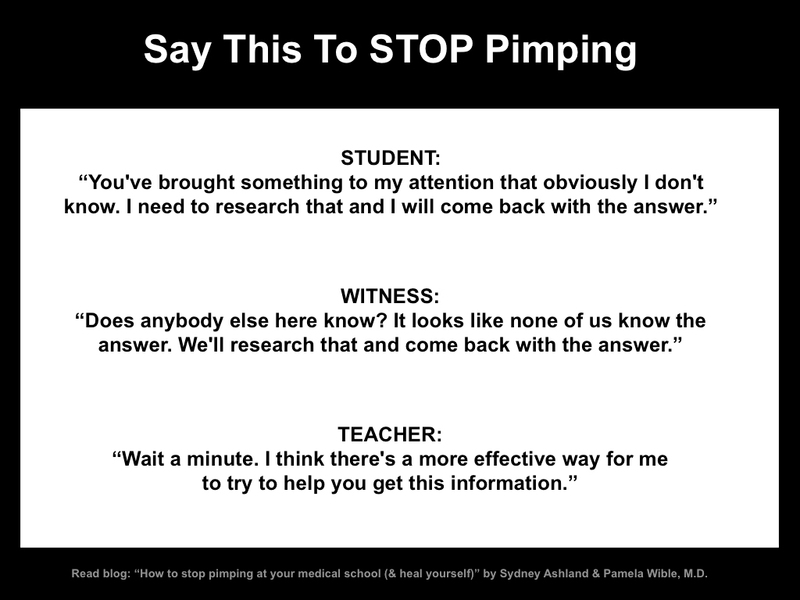 Pamela Wible: Maybe review a few of these things that medical students could hopefully easily do if they are witnessing pimping or if they’re being pimped. Maybe talk about if you are receiving the pimping, how should you frame the experience so that you don’t take it on it, it doesn’t stick. Pamela Wible: End the interrogation. Sydney Ashland: And the engagement. Disengage. Pamela Wible: By disengaging in a stem sentence that can be used for this disengagement would be what? Pamela Wible: That would stop it. Sydney Ashland: That stops it. If the person tries to continue to engage it, you have disengaged. Then, they are just arguing with themselves. Then, your whole peer group gets to witness that. Pamela Wible: Great! Then, if you’re a witness to a pimping session, what are some of the things that are one of the witness peers? Sydney Ashland: One of the witnesses can say, “I’m not sure about that either. I don’t know about that. Maybe we both should go and try and figure this out and come back with the answer. Does anybody else here know?” Turn to your peers. “Does anybody else here know? It looks like the whole class, none of us know the answer. None of us on rounds know. We’ll get that answer and come back to you tomorrow.” It’s a group effort. “You’re the dumbest group I’ve ever taught.” It’s pretty hard for that to stick to the whole group. It’s when we take it personally, when we start to believe that we are not smart enough, good enough, that our not knowing is a reflection on us being less than that we have to be concerned. Pamela Wible: You’ve mentioned what the person receiving the pimping can do, what the bystanders can do and I’m wondering these professors who have been pimped themselves 30 years ago and are now continuing the tradition, what is it that we can do to help them? Because they do need to heal and get with the program with modern teaching methods and they probably have mental health issues as a result of experiencing any number of things for 30 years without mental healthcare access? To be quite honest about this, many physicians rightly are fearful about seeking mental healthcare because they could have their license affected by that. That prevents us from seeking help for some of the wounds that we inflict on each other and the things that we naturally see in our patients who are suffering and dying around us. Just to share one thing that I had recommended to students who were being pimped, which is very similar to what you’ve said, which is like back out of the scene. “Look at this as if you’re a curious scientist from afar. Don’t take it personally. Let it roll off your shoulder. These people who were teaching you have been wounded themselves and they would not be in the cycle with you. What you need to do, if you can, it’s kind of hard, to muster the courage to try to help your attending heal and teach them maybe a better way to teach. What I’ve said in the past is maybe when you have a particularly wonderful teaching session that doesn’t involved pimping. Please give them positive feedback.” “Wow! Thank you so much for explaining the renal system the way you did today. That really has helped me with …” Please be appreciative of your attendings who are trying their best to teach you, but they might not know how to teach you. Sydney Ashland: Just because you are really good physician doesn’t mean you’re a good teacher. Pamela Wible: Even though doctor means teacher. Sydney Ashland: We can be loving, compassionate people on the planet and it doesn’t mean we are good parents. We often hear anecdotes about the adult who says, “I just heard myself saying exactly what my parents said to me. I had decided that I would never say that. I can’t believe that I heard myself saying what my mother said to me.” I would advise that for attendings, instructors, administrators. When you noticed that you are saying something that secretly horrifies you, you are like, “Oh, my God. I am being my worst nightmare to this student!” Out of frustration, out of overwork yourself, out of a lack of tools and skills that you’ve been provided with to teach these people to notice that, to acknowledge it. You don’t have to beat yourself up and make yourself wrong in it. You can just pause and say, “Wait a minute. I think there’s a more effective way for me to try to help you get this information.” That is the number one phrase that I would recommend. “Wait a minute.” You are pausing. “I think there must be a more effective way for me to help you get and retain this information.” Then, you become a collaborator rather than someone who is hierarchal. Sydney Ashland: Right. In a hierarchal system, you are over. In a more collaborative system, you are in the trenches together, learning together and the best experiences because not everyone has a bad residency experience. For those who have had a great residency experience, they talk about an attending or a mentor who took them under their wing, who was excited about the way that they think about the way that they ask questions, about their curious mind. It may be harder to do in a group, but the more that you can channel your inner teacher, learn from those teachers that are really good and where there’s documented evidence about how they teach. Bring yourself back to the reality that this is about teaching. It’s not about testing. It’s not about up or out. It’s not about disqualifying or eliminating those who are less than. That will naturally happen in and of itself if you’re a really good teacher. You don’t have to worry about taking that responsibility on. Pamela Wible: That’s great Sydney. Wonderful. In summary, how should medical students and premed students who contact me and they are nervous the first day of medical school, how should they frame their medical education experience so that they have the right attitude to make it through what appears to be an imploding medical education and healthcare delivery system that we are in now. We are in the process of restructuring and modernizing the way we deal with each other so that we could have healthy, happy medical students and physicians hopefully in the future. Is there a way that they should approach entering medical school? Sydney Ashland: I think with your eyes wide open. Taking on some idealistic, “I’m going to serve and save the world” type of mentality is not helpful. Your self-talk is very, very important. Those messages that you repeat over and over in your head. They need to be along the lines of, “I have the perfect personality type for this endeavor. All of the adversity that I have experienced in my life benefits me. I am not especially vulnerable to fear and manipulation for I am secure in who I am.” Listening to empowering audio tapes, watching TED Talks or YouTube videos with inspiring physicians or other people on the planet that inspire you so that you are resourced. You go in knowing what you are up against, not out to save the world and change the system, but out to really make sure that you come out unscathed, healthy and as a successful physician and practitioner. You have exactly the personality type that is needed. The adversity you’ve had in your life benefits you. You are not vulnerable to fear and manipulation. You are not hypervigilant. You are just aware. You are not someone who will create trauma bonds with those above or horizontal, and that you are here to learn all that you can and transmute that learning into serving. If that’s your approach and everything you do, say, eat, drink, all the relationships that you have support that, you will move through medical school, residency, the licensing process with grace, with your dignity intact, with a strong sense of self and the system will begin to change. Pamela Wible: Because a system is just made up of people. Pamela Wible: We all have incredible ripple effects that we can create just by being, here’s the secret—just by being yourself, just by being true to your highest ideals that brought you to medical school in the first place, that you wrote on your personal statement. The beautiful ideal that you had for your future as a physician, you can be that person now even before you get your diploma. You do not have to wait to be a healer. If you allow other people to be harmed around you or you witnessed something that is harming somebody and you don’t speak up, then you are not being true to your calling as a healer that brought you to this profession in the first place, which will make your diploma not such a fun experience either. You graduate medical school and you’re a victim and not a healer, then what good is the diploma? Sydney Ashland: Right. In witnessing harm without stepping forward, you are harmed yourself. If nothing else, that should be a motivator. Pamela Wible: When I speak to physicians who are practicing medicine and they come to realize how victimized and abused they’ve been over the years and have participated in some of this as a willing victim (at a certain point we have free will and we have to agree to play that role) they are rather horrified when they realized this. Some of them are just counting down the days to retirement and they’re not so encouraged to necessarily do anything about it. However, I will say that if we do not do anything about this, we hold the entire next generation hostage to the same thing that we’ve already experienced. The whole next generation of first year medical students now coming in this year will be taught by the same teaching methods that wounded you. The second years and the third years and the fourth-year medical students. If we are going to be true healers and doctors and teachers, we should help one another be who we can really be in this profession and stand up for one another. Sydney Ashland: Thrive, don’t survive. Pamela Wible: I want to just share one other thing before we end. Do you have anything else you want to share? Pamela Wible: Sydney and I have been teaching these teleseminars and retreats for medical students and physicians over the years and you all know how to contact me. For those of you who don’t know anything about Sydney before today and have never talked to me before, I just thought it might be nice if you wanted to share maybe even your website, email address, some way for people to contact you if they feel like they would like to talk to you. Sydney Ashland: My website is the thebodyenergetic.com. My phone number and all my contact information is there, but you can write to me at sydneyashland@gmail.com. My background is in the corporate world for years and then over time I developed my own private practice where I work as a consultant and expert in the field of mental health and wellness. Since I have worked with physicians for so many years and medical students, I’ve become very adept at helping them with their unique issues. I’m off the grid. I’m not connected to any medical school or medical organization. Pamela Wible: You are not on an EMR. You are one of the few health professionals that is not. Sydney Ashland: I’m safe. You don’t have to worry about contacting me and sharing your unique situation with me. Write me, call me. I look forward to getting to know you and helping you strategize so that you can reach your goals and be who you want to be in this world. Pamela Wible: I don’t often say this, but I want to give a shout out to veterinarians, dentists, anyone else in the health professions, even social workers, who feels maybe wounded from the things that you have witnessed in your clients and the ways that you have been treated during your medical education or working in various corporate medical environments. You are welcome to reach out to Sydney or myself and we want to help you. Sydney Ashland: Yes. Thank you, Pamela. Pamela Wible, M.D., is the author of Physician Suicide Letters—Answered. Her TEMED talk Why doctors kill themselves addresses the culture of abuse in medical training. Contact Dr. Wible. I left my second fellowship (pediatric pathology in a “prestigious” institution) because of the uncontrolled toxic environment, and also because of the pimping one of the preceptors inflicted on me. One example out of many: I once told him I couldn’t answer one of his questions and would come back to him later. He said he had all the time in the world and he wouldn’t let me leave his office until I gave the right answers. It was the end of the day, my mind wasn’t clear, and I had NO CLUE. It was something simple but very remote – I just couldn’t remember. As a result, we sat there in silence for 30 minutes. Yes, THIRTY minutes. Beyond words here. Wow! That’s why you need the GROUP support maybe. What do you think would have happened if you had your peers support you? PGME supported me and tried to help, but this pediatric pathology program was very notorious for its toxicity, as well as for the cruelty and lack of humanity of its PD within the university. In consequence, they recommended to quit ASAP. When I shared my concerns about getting a bad eval, and a future bad potential letter of reference in the future, they told me to redirect all inquiries to PGME Wellness, as they had a file documenting the events. I already had a job lined up at the time, so I came back to wait and see if the mistreatment would improve. It did not, and I resigned a week later. Best move of my life. The PD obviously did not appreciate the impact of my resignation on his reputation, so he added negative comments in my first eval that weren’t initially there. But who cares. I couldn’t get out of this hellhole fast enough. Oh great point! I’d say leaving online reviews about hospital, clinic, hazing doc from a patient or even anonymous staff could be effective. Amazing how public shaming may be the only way to stop some of this. Power in numbers. If all the staff complain and confront the offending doctor and take it up the chain of command then an individual would be less likely to be retaliated against. We really need our health care facilities to be SAFE places for all. Zero tolerance for abuse. 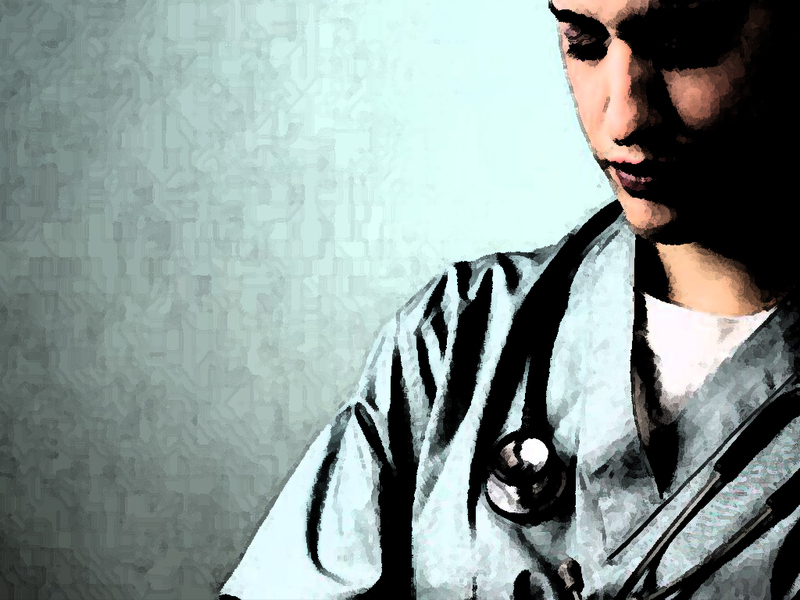 What could a nurse say, who was witness to “pimping” or really, call it what it is, hazing. I’ve never worked in a teaching hospital, if a nurse calls out hazing between an attending and students/residents will that nurse hear about it from nursing management? What could the patient say? Because if I witness it, I want to say something, I’d have a hard time not saying anything, I’m a very vocal patient in any case. I swear to God, if I were a patient in a teaching hospital and I witnessed this at my bedside, I would rip into the abuser and tear them a new one. I would then write a letter of complaint to the hospital, blasting the abuser and singing the praises of the new doctors as doctors. Not that that would accomplish anything, apparently…. It would accomplish more than you think. Silence, secrets, and censorship won’t save lives. We’ve already tried that. Failed. They didn’t like this answer much, and they didn’t think that I was good Internal Medicine material. But it had the power of being the absolute truth, and it interrupted the pimping activity very efficiently. Love it! All you need to do is stand up for yourself. What a simple solution. Thanks for sharing Paul! The argument for pimping was always that it was supposed to help you learn things better, but looking back, what I remember is the shame and humiliation. And also how the “right answer” totally depended on who was doing the pimping (So even if you had the right answer, you had the wrong answer.) I don’t remember a single factoid from any pimping session. So you lost the knowledge. But can you still feel the fear? Oh, and while my residency program was a good one, for some reason all the rest of the residents decided that we should include a pimping question when we interviewed applicants. I argued against us doing but apparently was the only dissenter. So I think everyone else did but I flat out refused when I interviewed people. “Tradition is just a bad idea held by a lot of people for a very long time.” Thanks for breaking rank. You are a leader! I must correct the record in that there was at least one other resident who objected, though I did not know that at the time. Still, it felt very much like I was swimming against the tide. One of my worst experiences in FP residency was as a brand new Intern on my first night of call. I was up all night trying to keep a 6 week old infant alive in the Pediatric ICU. First night of call, July 3, and one week before was a medical student. My upper level Resident refused to come in and I spent all night at the bedside or in the chapel on my knees praying to God the baby would not die before morning. Finally the morning arrived, the baby was alive, and the Attending the nurses had warned me about all night started rounds. I had never met him before, he was about my age (34 at the time, I was a late starter to college), and he immediately started pimping me. I was tired, no sleep in 36 hours, mad as hell at the system for putting an innocent child’s life in danger, and when he asked me the second esoteric question, looked him straight in the eye and said “I have absolutely no idea what the answer is!” And I never blinked or looked away until he finally said, “OK, anyone else know the answer?” No one did, but in that minute I learned to not take crap from anyone and stood up for myself. Afterwards all the other medical students just laughed and said, admiringly, I can’t believe you said that. But I was rarely harassed after that by any of the Attendings. I believe the harassers are essentially bullies and bullies learn very quickly who they can bully and who they cannot bully. As an upper level Chief Resident, I was in charge of Medical Student education when they were spending a rotation on our service. The first day I sat them down and told them they were not there to be “scut monkeys”, they were there to learn. I did not allow the other residents to use or harass them. At the end of my residency I received the Teacher of the Year for my Residency Program. That was 22 years ago and I’m still very proud of that award. My niece just started Med School this week and I worry daily that she is going to suffer in this same senseless manner that is of no benefit to anyone. Wow Rebecca! We need more doctors like you. Congratulations on a well-deserved award!!! Were you voted in by students or by your colleagues? Curious . . . The Students got to vote. It was a great honor. This is such an inspiring story. Thank you for your service! My presentation at rounds was inadequate. The criticism from the staff IM doc was so harsh, I could not take it. I spaced out, froze, saw a white light, and then the harangue stopped. The other medical students sat there and said nothing – no support. Although I couldn’t put my finger on it the time, I learned nothing except that I had failed, and failed miserably at that. The internal medicine inquisitor was a sadist. IMO, he could not make it economically in private practice because of his flawed personality. The halls of academia protected him. Consequently, I would like to ask if my thesis is true. Did academia – which paid its staff far less than the going rate in private practice at the time – keep sadistic criminals on staff? Could they not afford better? Did the administration view the students as paying serfs with no rights? BTW, in 1975 – the end of the Viet Nam war – the first thing the administration told us in assembly is that there were 145 “qualified” candidates for each slot – and that we lucky.